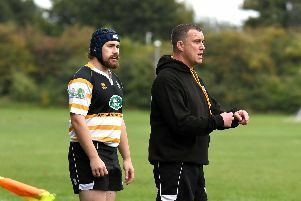 Head coach Neil McRoberts was disappointed with the way Portsmouth played in the 31-22 defeat to Warlingham at Rugby Camp. The team did not manage to stick with the plan he set them and as a result lost for the first time this season in London three south west. A poor first-half performance was very costly. They improved considerably but failed to make up the lost ground. McRoberts felt it was the way they went about things early on that set them back. He said: ‘We paid the price of not sticking to our game plan in the first half. ‘Unlike in previous games we failed to control the pattern of the game. ‘Against a big side we needed to make sure we retained possession. ‘Also we weren't physical enough against big opponents. ‘That didn't happen and instead we either lost the ball in contact or kicked it away. ‘We just couldn't keep hold of the ball and gave it away cheaply. ‘To be fair our opponents capitalised on it well. ‘It goes to show that when you play against the top sides you can't afford to just play for half the game. The visitors quickly raced into a 14-point lead at the start before Portsmouth managed a reply. Full-back Luke Simmons crossed for a good try in the corner but Warlingham continued to dominate and soon extended their lead. It wasn't until the start of the second half that Portsmouth began to get their game together. Soon after the restart Jack Easterbrook went over for a try quickly followed by another from Finn Parry. Parry forced his way over from a good catch and drive from a line-out. Simon Morgan added the conversion and suddenly Portsmouth had cut the deficit to 24-17. The next score was crucial but it fell to the visitors. Two minutes from the end Parry scored his second try after gathering from a charged down clearance to earn the home side a bonus point. McRoberts now wants to see his men hit back in the right manner. He added: ‘It is what happens after you lose a game that is important. ‘We showed in the second half that we have the quality to beat the top sides. ‘Now we just need to do it for 80 minutes.